Anyone who buys fleeces or raises sheep ends up with a pile of wool that isn’t good enough to use. Fleeces are skirted after they are shorn to remove unsavoury bits and pieces. How much is removed depends on how dirty the fleece is and the expectations of the person doing the skirting. Typically though, this means removing the neck, belly, and britch (back leg) wool. This leaves the best parts of the fleece ready for washing. What to do with all of this unwanted wool? 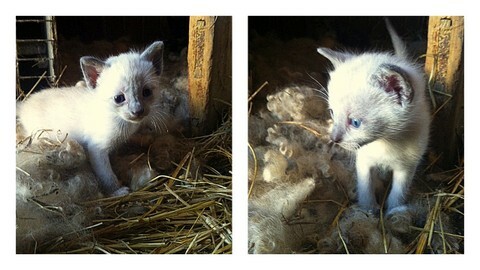 I compost most of my skirted wool, but my favourite way to use it is in the making of kitten nests. 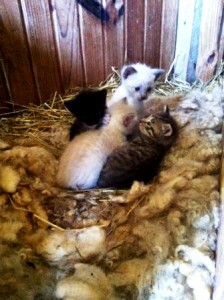 Our farm has twelve barns, so barn cats are a necessity. Outdoor cats without enough to do can disrupt native ecosystems, but our cats usually stay busy patrolling grain-stores and hay-mows. So, I often put piles of skirted wool in the places used as nurseries by the mother cats. Right now, there is a little cat family living in The Office. My great-grandfather, Urbane Carter, used this space to settle sales during livestock auctions held on the farm during the 1950’s. The cats find it is a grand place to hide kittens. of course, a request for more kitten photos.